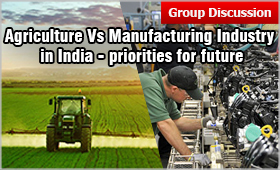 To help the participants tackle the topic covering all aspects on Agriculture – its importance in Indian Economy; How to improve Agriculture and condition of farmers engaged in Agriculture; Agriculture Vs Manufacturing Industry; How to double the farmers income-steps taken among others, MBAUniverse.com has prepared and shares the key facts about the role of agriculture and manufacturing Industry in Indian economy, the constraints in these sectors & policy suggestions to improve the role of Agriculture in manufacturing alongwith the ways and means to increase the agriculture income. The topics is of great significance in the context of Indian economy in GD round. Agriculture and Manufacturing industry are drivers of growth for any economy. India, which has 70% population living in rural areas with Agriculture as the main stay of employment, is setting up goals to improve the condition of farmers by targeting to double the Agriculture income by the year 2022 and make it a high growth, highly employable sector at par with manufacturing industry and the service sector. Modernization was first initiated under the II Five Year Plan, famously known as the Nehru-Mahalanobis plan which focused on pushing up the heavy and basic goods industry to build local capacity and reduce reliance on foreign goods. This was thought to be a policy impetus to absorb the surplus laborers in agriculture and counter disguised unemployment in the sector. In India, agriculture contributes around 15% to the GDP and absorbs a little more than 49% of the labor force. The manufacturing sector contributes around 19% to the GDP and absorbs around 27% of the labor force. South East nations have grown and become the global manufacturing hubs despite being at comparable GDP levels to India in 1970s and 1980s as they focused on building local manufacturing units through both public and private investment. Generates Trade Surplus: India’s share in global agriculture produce is 7.68%. India has maintained an overall trade surplus in agriculture since 2000s. The overall trade (exports+ imports) has also grown. India’s relative comparative advantage in agriculture is greater than that in manufacturing and commercial activities. Generates greater investible surplus & savings: The rise in agriculture output and income can expand the market for manufacturing sector. The migration of surplus labor from agriculture to manufacturing. This supports urbanization and industrialization as it did in England in 19th century. Agriculture Bias: Farmers have not been able to fully exploit the comparative advantage in agriculture exports due to overvalued exchange rate, tariffs and quota restrictions on trade of agriculture products. Decline in per capita availability: Despite an increase in yield, the per capita availability of agriculture output has fallen due to excessive diversion of stock in silos and procurement and release was ill timed. It has also put inflationary pressure during draughts. Technological reforms to improve efficiency and to reduce dependence on monsoon as still around 53% agricultural land is rain fed. Rationalize food and fertilizer subsidies to circumvent inefficient resource allocation towards certain crops like wheat and rice. Manufacturing has the highest multiplier effect (backward linkage) on economic growth. Provides modern inputs and implements for other sectors like fertilizers for agriculture. The GVA by Automobile Industry is around 6% as of 2017. India is among the leading automobile manufacturers and can emerge as global market leader in other segments. Automobile sector’s employment multiplier value of five which is indicative of its large employment generation capacity. The rising inequalities and unemployment can be tackled by absorbing labor in manufacturing sector especially in labor intensive sectors like textile. It can act as a driving force in India’s growth trajectory through capital accumulation and better capacity utilization which currently is at 70%. Make in India needs both public and private investment to make India a manufacturing powerhouse which will increase its export demand and GDP by creating new job opportunities. The value added by MSMEs to manufacturing is more than 30%. They require more credit and better ease of doing business to allow greater financial inclusion, encourage entrepreneurship and gender equality. Emphasis on agriculture as the prime industry of rural India urges doing everything possible to make agriculture both a source of income and the pride of our nation. The Prime Minister Modi’s Israel visit has placed a heavy stress on agricultural cooperation. It is felt that Israeli agriculture and irrigation technologies can help deliver this goal. Improving technology, increasing milk production, use of solar light, honey production. Increase afforestation by planting more trees along the river banks to avoid soil erosion during floods and to keep the rivers flowing eternally without getting them dry. Government of Madhya Pradesh organized Narmada Yatra and has taken steps to prevent Narmada River from going dry in next 100 years. The Niti Aayog has prepared a ‘Three Year Action Agenda’ – a plan that covers a time period up to the 2019. In its chapter on agriculture titled ‘Agriculture: Doubling Farmer’s Incomes’, the economic think-tank has put forth a 4 point action plan to double the incomes of India’s farmers. The 4 point action plan to improve Agriculture income includes 1) Remunerative prices for farmers by reforming the existing marketing structure; 2) Raising productivity; 3) Reforming agriculture land policy; and 4) Relief measures. A subsidy would be provided on targeted produce in case the price falls below MSP-linked threshold. It would spread price incentives to producers in all the regions and all the crops considered important for providing price support. The government and NABARD are pushing farmer-producer companies where a large group of farmers pool their land together and work as a collective. Maharashtra has already asked the Israeli Consulate in Mumbai to prepare a plan for establishing a farmer-producer collective in Dehni village in Yavatmal district, which has one of the highest incidences of farmer suicides. India has already adopted drip irrigation in some parts of Maharashtra, Gujarat and Haryana. Israeli firm Netafim, the world’s largest micro-irrigation company, indigenized its Family Drip System (FPS) for mainstream farming in India. Drip irrigation is now available for farms that are as small as a quarter acre. Agriculture and Industry are complementary and not competitive in nature due to demand, production and savings- investment linkages. India needs to revamp its manufacturing sector and agriculture sector by using scientific methods of production which are economically feasible and practical, environmentally sustainable and globally competitive to exploit the gains from trade, increase output &s employment and reduce inequalities. Initiate the group discussion only if you are well versed with the facts and information on the GD Topic. If you are not well versed with the topic and feel a bit low on content, try to gather information from first 1-2 speakers and then participate. Quote facts and figures, if you are sure of the authenticity. You may encounter volley of counter questions on the facts and statistics from your fellow participants. Unless very sure, don’t use it. Make multiple entries using the opportunity to speak. Note down important information from other participants and turn it to your benefit. Since GD is a sort of debate, you should have a clear view point on the topic - either for or against. Do not switch viewpoints. However, if you have points for both for and against the topic, substantiate your viewpoint with well qualified data, examples or exceptions. Even if you agree or disagree to the view point of other participant, add value by giving reasons for it when you speak but don’t simply say I agree or disagree.